Progressive Conservative leadership hopeful Frank Klees sees too much red at Queen’s Park and says it’s time to do something about it. During a brief editorial board meeting in the Vaughan Today newsroom Monday, the Newmarket-Aurora MPP discussed provincial issues and his leadership bid. Top of mind for Klees was positioning his party with himself at the helm as the best alternative to Premier Dalton McGuinty’s Liberal government and the best hope of toppling bureaucratic hurdles. “Other jurisdictions around us — whether it’s other provinces or states, Michigan, Ohio and other states with whom we compete in Ontario — they roll out the red carpet for new businesses,” he said. “You know what we roll out? We roll out the red tape. The same goes for transportation and other infrastructure projects, which Klees said get mired in bureaucracy, creating delays, greater costs and ultimately, gridlock. Part of the solution, he said, is to change how provincial funds are set aside and delivered. “Every once in a while, the minister or the premier will show up in Vaughan or Richmond Hill or Newmarket and it’s another funding announcement for $30 million here, a million here — every once in a while it’ll be a big number, like they’ll announce a $30-billion number,” Klees said. “But where are the bulldozers? Where are the projects? He suggested a Klees-led Tory government would appoint a cabinet minister responsible for the long-term planning of projects up to 30 years in advance. “If you know where the infrastructure is, if you know where there’s a subway that’s going to be planned, if you know where there’s a rapid rail that’s going to be planned, then you can begin to plan your communities around that,” he said. Figuring large in the PC leadership race is the issue of the looming harmonization of the provincial and federal sales taxes, which Klees called a bizarre thing to introduce now. “You cannot implement an HST that increases taxes by $2.5 billion on the backs of families and businesses at a time of recession,” he said. 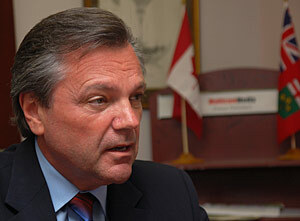 But, Klees said, should he win his leadership bid and go on to become premier, he would not repeal the harmonized tax. Instead, he would reduce the provincial portion of the HST. Voting for the next PC leader and successor to John Tory is set to take place June 21–24. Klees is up against Niagara West-Glanbrook’s Tim Hudak, Whitby-Oshawa’s Christine Elliot and Randy Hillier from Lanark-Frontenac-Lennox and Addington. The winner will be announced June 27.